See this photo? 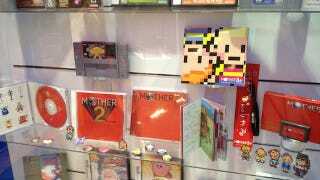 It's a lovely display from the Mother series, captured by Kotaku friend Matt Hawkins at the Nintendo World Store in New York City. Isn't this fantastic? Look at the adorable sprites. The cartridges. The CDs. It's really lovely. Which would all be well and good, except Nintendo of America has spent the past two decades pretending this series doesn't exist. In other words, the company is just teasing us. Mother 1 never made it here in any form. Mother 2 squeaked onto U.S. shores as Earthbound for the Super Nintendo, but it's nowhere to be found on the Virtual Console, and we never saw the Game Boy Advance port. Mother 3 also never made it to North America, although there's an unofficial English patch floating around. I reached out to a Nintendo representative this morning to ask if this new display signifies that the company maybe wants to show America some Mother love, but I haven't heard back yet. Nintendo likes being cruel. Update: Several readers have e-mailed me to say they asked Nintendo World Store employees about the exhibit. According to one reader, everything in the case is employee-donated. So maybe Nintendo isn't being all that mean after all. The display at Nintendo World features many different historical Nintendo products and franchises from around the world. It is not meant to signal any announcements regarding the featured games.